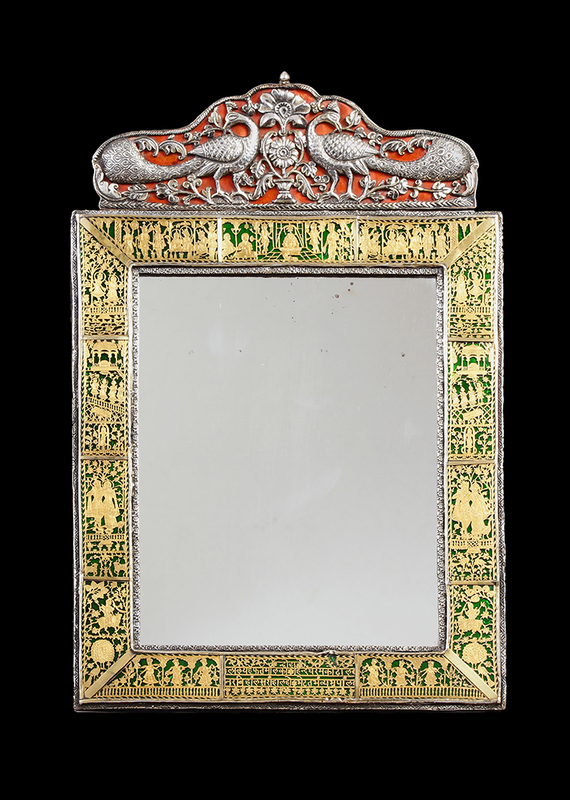 This tabletop mirror comes from Partabgarh in Rajasthan and depicts religious scenes from Hindu dharma surmounted by an impressive repoussé crest. This open-work crest, made from silver and applied to a red enamel background, shows two magnificent peacocks separated by a floral ornament in a vase. The top central panel shows a trimurti sculpture within a temple setting, representing the supreme divinities of Brahma, Vishnu and Shiva. A bearded man, probably a local ruler and the subject of the inscription at the bottom of the mirror, and his attendant, sit to the left of the trimurti in reverence. The two flanking panels depict Rama, Sita and their most loyal follower Hanuman in a darbar. Four more panels run down each side of the mirror and these show Shiva riding on his cow Nandi, Krishna with his gopis, or Radha in one of her playful poses. In the top left and top right panels Krishna plays the flute to Radha and they stand in front of a low pillar wall which separates them from a lake filled with ducks, fish and turtles. Bottom left and right, in the same panel where Shiva rides Nandi, a peacock spreads his train of feathers in a bid to court a peahen. Son of Fatmal, who is the protector of the Hindu religion. A subject’s happiness is a great gift from his King. These vignettes all show lush gardens filled with such things as flowers, birds and pagodas, and help to frame the rectangular mirror beautifully. This mirror came from the estate of the third Baron Lord Mark William Ogilvie Birdwood (1938 to 2015). His great-grandfather was Herbert Mills Birdwood CSI, LL.D (1837 to 1907) who was the brother of Sir George Christopher Molesworth Birdwood KCIE, CSI (1832 to 1917), keeper of the Indian Museum at South Kensington (now part of the Victoria and Albert Museum) and author of The Industrial Arts of India. In his book, Sir George Birdwood explains the process of making ‘Pertabgarh work’ and uses a casket from the collection of Queen Victoria to illustrate this. This casket was presented to Victoria by Maharaja Dalpat Singh of the princely state of Partabgarh, Rajasthan, in 1864 and it still forms part of the Royal Collection today. At the time of writing, it is on loan to the Victoria and Albert Museum and displayed in the South Asia Gallery (LOAN:ROYAL.792). G. Birdwood, The Industrial Arts of India, Chapman and Hall, 1884, p.218.